With the rise and rise of computing capability, very large scale surveying of the content of our own galaxy, the Milky Way, has become achievable. At optical wavelengths, leading science goals are to: take a Galactic census of the young/old/high-mass extremes of stellar evolution; map the ionized interstellar medium at arcsecond resolution; map extinction due to interstellar dust across the Galactic disc. In the near-infrared domain, the goals shift to studying the variable sky and to characterising young star-forming regions, largely free of interstellar extinction. In the sub-millimetre, the goals are to find and characterise the early stages of star formation, mapping the molecular clouds hosting this process. These survey activities stimulate a range of follow-up observational programmes, including spectroscopy aimed at e.g. refined classification of survey-selected objects or at measurements of radial velocities to support kinematic modelling of Galactic structures (be they stars or molecular clouds). 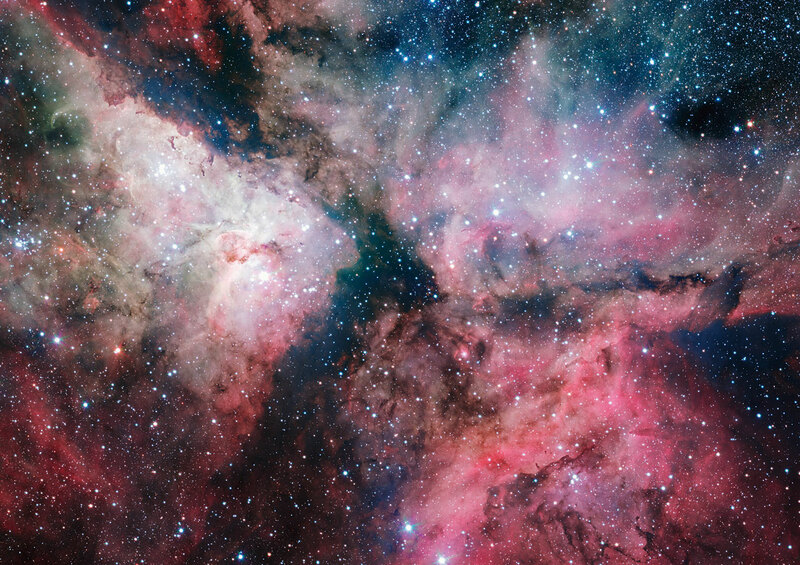 ESO postcard of the heart of the Carina Nebula, part of the spectacular star-forming region seen end-on along the Carina Arm of the Milky Way. This image was obtained with the VST through filters including the Hα filter bought for the VPHAS+ survey.